Our Top Selling Home Water Distiller is now available for France, Germany and other European countries with 230 volt electronics and standard EU plug. 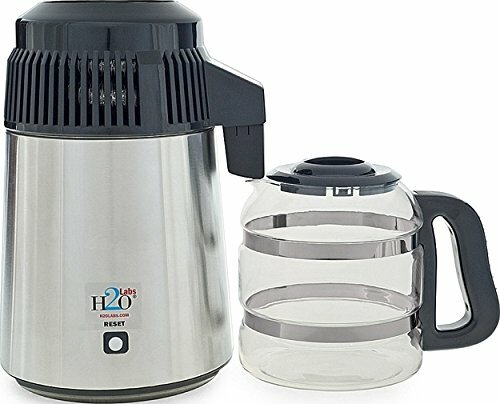 This is the BEST one gallon Countertop Home Water Distiller with Stainless Steel Main Body Exterior; Stainless Steel Condensing Coil; 100% Stainless Steel Steam Chamber, (Bottom, Sides AND Top Dome). Comes with High Quality One Gallon Glass Carafe with Ergonomic "Easy-Lift" Handle. Features single-button start and is easy to clean. It can be used in any country that requires 230 Volts and has a standard Euro plug which may require a plug adapter depending on the country of use. The entire steam chamber, (bottom, sides and dome), and the full length of the condensing coil is 100% Stainless Steel, Grade 304, (also known as 18/8), the most widely used and versatile of all the stainless grades. All plastics used are Food-Safe and BPA-Free. This model also has an innovative Glass Nozzle Insert so pure water doesn't touch plastic or metal. Everything you need to begin making the PUREST water ever is included!. Along with your water distiller you'll receive the "Easy Lift" glass carafe, a large jar of non-toxic Cleaning Crystals in case it's needed for hard water scale, and a year's supply of H2o Labs Exclusive Activated Carbon Pods. If you have any questions about this product by H2oLabs, contact us by completing and submitting the form below. If you are looking for a specif part number, please include it with your message.